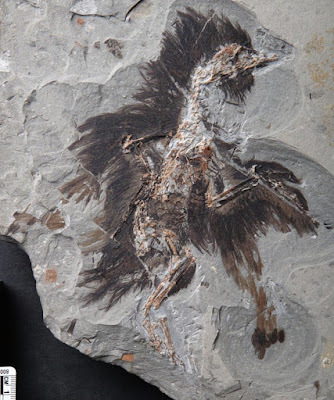 A 130 million years old fossil of Cretaceous age bird confirms with the oldest evidence of structural beta keratin that can able to survive million of years without being fossilized. Eoconfuciusornis is a crow size bird which lived in a place now called northern China and it is the earliest bird known to have keratinous beak without teeth. Currently the specimen is housed in China’s Shandong Tianyu Museum of Nature, which is the world’s largest dinosaur museum according to Guiness World Records. Initially scientists thought that the fossil held pigment structures to be melanosomes. Mary Schweitzer, professor of Biology from North Carolina State University underwent several experiments to make sure that these melanosomes aren’t microbes. "If these small bodies are melanosomes, they should be embedded in a keratinous matrix, since feathers contain beta-keratin," Schweitzer said in a report. "If we couldn't find the keratin, then those structures could as easily be microbes, or a mix of microbes and melanosomes," which would lead to inaccurate predictions of pigmentation. Schweitzer and her colleagues used Scanning and Transmission Electron Microscopy techniques to have better view of the fossilzed feathers and internal structures. They also used immunogold labelling where gold antibodies can able to bind specific proteins (like keratins) that allows clear visibility under electron microscope. Additionally, scientists used high resolution imaging to map the copper and sulphur within the feathers. Sulphur was expected to be the part of keratinous material. The research was published on Novermber 21st 2016 in the journal PNAS. This study was the first to demonstrate the earlierst evidence of keratin and melanosomes. Researchers hope that this will unfold many questions like how and why feathers involved these lineages. Bacteria in Our Mouth Could cause Migraines?